Caroline Dale ('cello) studied at the Royal Academy of Music in London and later with the legendary Pierre Fournier in Geneva. At 15 she was the youngest ever recipient of the Isserlis Scholarship. Caroline was a member of the Nigel Kennedy Quartet and the Balanescu Quartet, as well as founder member of the American–based Apollo Piano Trio. Prior to her appointment as Principal Cellist of the English Chamber Orchestra she was principal of the BT Scottish Ensemble and the London Chamber Orchestra. She has appeared as concerto soloist with the London Philharmonic, Royal Philharmonic and Royal Liverpool Philharmonic Orchestra. 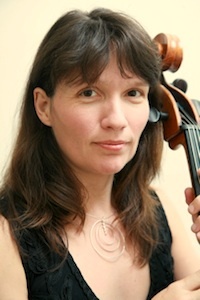 Caroline’s recording career includes the solo cello music for the films ‘Hilary and Jackie’ (about the life of Jacqueline du Pre) and ‘Truly Madly Deeply’. In1995 she formed her own group ‘Ghostland’, writing and performing her own music with the band and recording on the Warner and Instant Karma labels. In 2003 she released her solo album ‘Such Sweet Thunder’, which combined classical repertoire with her own compositions. In 2007 she was the solo cellist on the film ‘Atonement’ with its music written by Dario Marianelli winning him the Oscar for the Best Original Film Score. Marianelli then wrote his Atonement Suite for cello and piano, dedicated to Caroline, which was premiered at her Wigmore Hall recital in 2008.